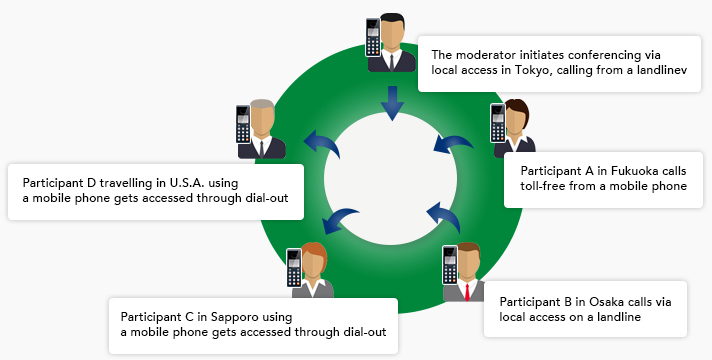 Rates - Global TaNK Co., Ltd.
Local Access In Japan 18yen/connection Borne by Participant Conferencing participants (the organizer and participants) pay calling rates. Charges to connect to the access point will be billed to participants by their carrier. "Dial-out" is a way to initiating conferencing in which the moderator uses the web console to dial participants automatically or requests an operator call participants. At the scheduled time, participants wait near their phone for the call. No charge is incurred to participants. The service rate (including calling rates) will be billed to the moderator. For other countries, contact us for details. A discount is applied depending on the total audio conferencing minutes that month. There is no recurring basic fee whatsoever. A 15% discount is applied automatically when you exceed 2,000 minutes of audio conferencing in a month. Similarly, a 20% discount applies after 10,000 minutes and a 25% discount after 30,000. Because the discount depends on monthly audio conferencing, the appropriate discount is applied automatically whenever usage exceeds these levels, regardless of whether you connect by dialing toll-free or by using dial-out. There is no need to sign up for the discount plan. Sample rates for 60 minutes of conferencing in this scenario are as follows.